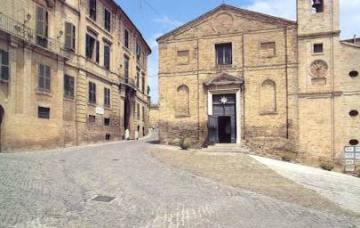 A remarkably attractive small hill town, Recanati is close to the heart of many Italians as the birthplace of one the country's greatest poets, Giacomo Leopardi (1798-1837). This dignified place, just inland from the Adriatic Sea, is strung out along the crest of a hill. It was renowned in the 16th and 17th centuries for its commercial fair, one of the most important in the Papal States, and its wide streets and comfortable buildings still bear a mercantile character. Nowadays, however, it is remembered for its famous son, Leopardi. He passed a hothouse childhood, self-imprisoned in his father's classics-filled library and spent the rest of his life trying to recapture in his pessimistic verse the illusion of happiness, glimpsed fleetingly as a youth in Recanati. Palazzo Leopardi at the southern edge of town, where he was born and brought up, holds memorabilia, manuscripts and his fascinating library. Around every corner, plaques mark spots referred to in his poems. The museum in Villa Colloredo-Mels, a splendid 18th century villa on the edge of the town centre, holds Recanati's greatest art treasure, a room with four of Lorenzo Lotto's finest pictures, including a most haunting Annunciation packed with almost breathless narrative detail - a high spot in any art-lover's tour of the central Marche. Recanati was also the home town of the great tenor, Beniamino Gigli and the Museo Gigli in the Palazzo Comunale, or town hall, on central Piazza Leopardi holds a collection of his costumes from some 30 operas, a mock-up of his dressing-room and some of the many presents he received, including a walking stick from Verdi. 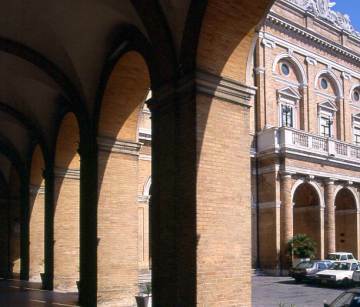 Other delights in Recanati include the Cathedral of San Flaviano with its magnificent 17th century wood ceiling and the Teatro Persiani, another of the Marche's unexpectedly grand 19th century theatres.